1 package Butter Crackers, (About 35 crackers) crumbled. Equivalent to 2 cups. (The traditional recipe usually calls for saltines, but I prefer the flavor of butter crackers. Besides, I can't find American Saltines in Denmark. You can use Tuc crackers, Ritz, Club, (Club Social para los Latinos) or any other similar cracker which may be available in your area. Marinade the Steak for at least 40 minutes and no more than an hour prior to proceeding with the recipe. For best results, seal steaks in a plastic freezer bag with the marinade, turn the bag to ensure all the steaks are well covered and place in fridge. Turning the steaks over every twenty minutes helps to ensure they marinade evenly. You want to crush the crackers by hand, not put them in a food processor. This doesn't take a lot of effort and it gives you a nice mix of fine and larger bits which gives the breading a much nicer texture and crunch. The easiest way to prepare the breading is to place the crackers inside a freezer bag, crush the crackers inside, put the dry breadcrumbs over that, followed by the flour, baking powder and seasoning. Close the bag, crush it all together, so that you break up whatever over-large chunks remain of the crackers, then shake it all thoroughly so that it is blended. 1. Pound the steaks vigorously with the spiked side of a mallet meat tenderiser until the steaks are about 1/4 inch thin. Turn over as you are pounding to be sure you tenderize both sides evenly. 2. Beat the eggs with a fork until they are thoroughly blended and they froth. Place these in a plate that is slightly deep so that the eggs don't splash around as you coat the steak. Pour half the Breading mixture onto another plate and distribute it evenly for coating. Dip the flattened steaks into the egg mixture turning them to coat evenly, then place the steak on the breading mixture. The best way to ensure an even coating is to sprinkle the top with a little bit of the reserved breading so that you can gently press down on the steak to thoroughly coat the part underneath then turn the steak over and repeat, pressing down again until all the breading is firmly incorporated into the egg. The coating should be dry to the touch, not sticky. If it sticks when you touch it, you need to sprinkle more of the reserved breading on top and distribute it again, pressing down gently again. 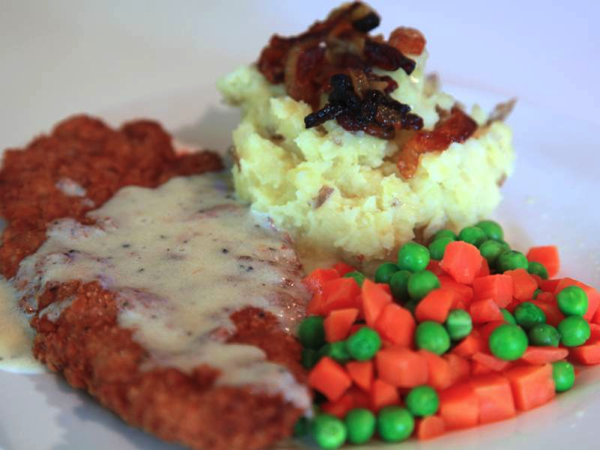 Place the breaded steak on a third plate you have set aside. Repeat with the remaining steaks. NOTE: You want to layer the steaks on the plate when they are breaded but you don't want them to stick after sitting, so I recommend sprinkling some breadcrumbs between the layers. You'll find you have plenty of breading to do this, and some will remain on the breading plate when you're finished which you can sprinkle over the steaks before you refrigerate them to protect them. I don't cover the steaks before I put them in the fridge. I suppose you could, but I find it helps to dry and set them a little more if they are uncovered. Chill the breaded steaks for at least ten minutes before frying. 3. Pour oil into a frying pan large enough to hold 2 steaks at a time, and deep enough to hold the oil with enough space remaining at the top so that it doesn't spill over when the meat goes in. A 12 inch pan should be just about right. Turn the stove to maximum heat, and allow the oil to rise to a temperature of approximately 360 degrees Fahrenheit. When the oil is hot, remove the steaks from the refrigerator and place in the frying pan, two at a time. I find it is good to listen to the oil in order to know when to turn the meat. When the steaks first go in, they should sink, froth slightly and have a low-pitched frying sound. As they reached their done point for one side, they begin to float and the pitch of the frying sound rises slightly. It should take 1 ½ to - 2 minutes per side. You'll want them to be a rich golden brown. Turn the steaks in the frying pan with tongs and then remove them to a plate which has a layer of paper towels to absorb any excess oils which remain. You may want to keep the steaks in a warm oven (225 degrees Fahrenheit), especially if the weather is cool. If so, be sure to place them on an oven-proof dish when they come out of the pan. 4. Whisk together milk and dry ingredients until a nice froth forms. 5. Melt butter in a 10 inch pan until it is clear and starting to bubble, but not browned. Pour in the milk and flour seasoned mixture and whisk to blend thoroughly, cooking at a medium-high heat so that it bubbles nicely, until it thickens. This needs constant watching as the milk in the gravy may cause the whole thing to froth over and burn. Stay with the gravy until it is done and ready to pour. Because the gravy can form a thin film on top, it is probably best to leave this step for very last in all your meal preparation. In other words, have your side dishes ready with the steaks before you go to make the gravy. You want the gravy to have a nice body and flow smoothly. It thickens a little more as it cools. If you reduce it too much, it might get too thick as it sits on the table. Pour a little gravy on the steaks when you serve them, and serve the rest in a gravy dish for your diners to lavish on as they please. I served this with a side of Rustic Mashed Potatos with Caramelized Onions, and some simple peas and carrots. I can't see serving Southern food without Biscuits or Corn Bread, so I chose Lazy-Day Whole Wheat Biscuits.